Homeowners often forget about garage security. The garage is often overlooked when in fact, it is one of the most vulnerable parts of the home when security is considered. It is important to note the garage is an easy target for vandals and thieves. Whether you use your garage for parking the cars or for other things, chances are your garage holds valuable items from the cars and the riding mower to power tools and other expensive equipment and recreational items that may catch a burglar’s eye. Below are nine tips to help you keep your garage and everything inside of it safe and secure. 1. Make a habit of locking garage doors and windows when you are not inside. Quality locks on doors and windows will deter potential break-ins. 2. If your overhead garage door has an interior lock, lock the door from the inside whenever possible and especially at night. Criminals are getting smarter. Even with a quality garage door opener, criminals can still get inside your garage with little effort by rolling the door up. If the door has interior locks, use them. 3. Check your garage door for damage and weak points. If you find any cracks in the door, broken window panes or loose panels, have them repaired immediately or replace the garage door. Any weak points in the door make it easy for criminals to pry it open. 4. Deter criminals and thieves by using outdoor lighting. Burglars know most garages are unoccupied at night making it easy to break-in the garage and steal or damage items without being noticed. Install motion lights and landscape lighting to light up the garage, doorways and walkways at night. Also consider installing security cameras. These will make burglars think twice about breaking-in. 5. Stolen garage door openers are becoming a growing problem. Keep your car doors locked at all times even when you are home. If you discover your garage door opener is missing or has been stolen from your car change the frequency and code for the garage door opener immediately. 6. Do not leave your garage door cracked for ventilation. The slightest crack at the bottom of the garage door offers an opportunity for a criminal to break-in your garage. 7. Only keep the garage door open when necessary. If it is not necessary, be sure the door is closed. 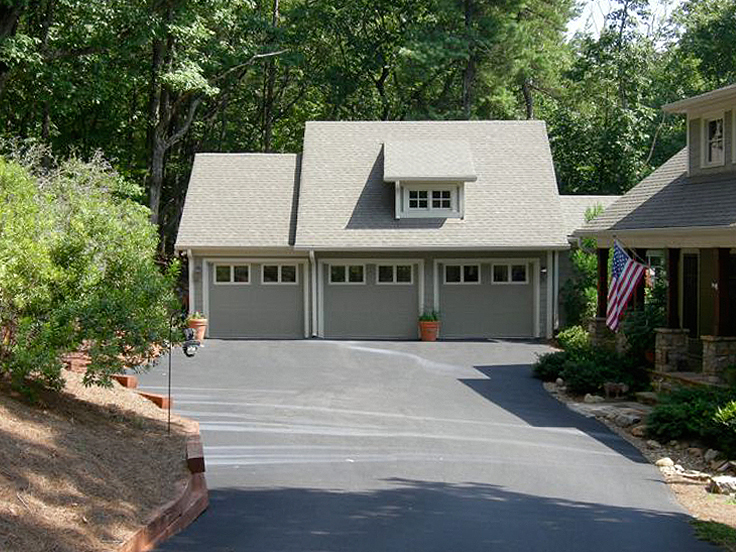 An open garage door allows any passer-by to see just what you store inside your garage. If they see something valuable, they might come back and steal it at another time. In the same way, leaving the garage door open puts your belongings at risk to be vandalized. You never know when someone might come back later and ransack your garage or damage your new ski boat or the restored vehicle you keep inside. 8. If your garage is attached to your home, lock the door between the garage and the living space of the house. This door is an entry point to the home for criminals and most homeowners don’t recognize the threat because it is considered an interior door. Protect yourself at this entry point with a sturdy door and quality locks. 9. If you protect your home with a home security system, be sure the garage is included in the security system. While garage security is often overlooked by homeowners, you can help protect yourself and the things in your garage with these handy tips from The House Plan Shop.